November | 2014 | What Makes That Black? It’s amazing how skin can feel the color of bed sheets. These are white. Before opening my eyes I can tell – I can feel feather-pillows in white cases and bleach-white sheets mounded around my muscled legs. I move my fanned locks from across my face and open my eyes… in the light-darkness of early morning I see my body and the tips of my waist-length hair — comfortable, languid and cat-like. Beautiful this contrast, brown skin, black locks and white sheets – like liquid chocolate, whipped cream, and licorice sticks. My mind gleefully spins the myriad of black, brown, white combinations as I turn toward the night stand and glance at the clock. It is 3 am and I am awake, as in “don’t-even-bother-trying-a-new-position-to-encourage-sleep” awake. So here I sit, with lavender and peppermint tea versus my usual jasmine green because I do hope to return to sleep some time this morning, but first I must give way to the stories. The initial pre-dawn image that streamed along my neural-synapse highway was that of a brief exchange with a Euro-descendant woman from Texas. We were in the Valley of the Kings, on the West side of the Nile, in the desert. Actually, to say that I was in Egypt and in the desert is redundant. But what I am trying to communicate is that despite the fact that I was in Egypt in January it was sweltering, dry and “only” 90 degrees. When a breeze occasionally arrived it could result in a mouth full of sand, as a result breezes were held suspect and I tried my best to avoid them. I had just finished hiking out of the depths of my forth tomb, that of the stepson and nephew of the only female pharaoh, Hatshepsut–Tuthmosis III, when we met. I was hot from the heat of the day, ducking breezes and from the Herculean exertion of tomb climbing. Let me stop for a moment and explain the physical demands and the aura of this tomb. The entrance is almost 100 feet above the ground and I had to climb an extremely steep exterior metal-staircase, transcend into the mountain via two narrow long corridors, and descend another set of 100 plus stairs. All three structures carried me deep into the mountain. I walked through the tomb’s ritual chamber and pillared hall before reaching the burial chamber of reduced oxygen. It takes some psychological grist to go into these small spaces buried deep in a mountain – and one does feel the strength and immensity of the mountains. At times I had to breathe slowly and deeply. This focus kept my psychology from a mild flare of panic in the extraordinarily steep and extemely narrow spaces. I poured the same amount of attention on putting one foot or, when crawling, hand in front of the other. These tombs are not for the faint of lung or the claustrophobic. Coming out of the tomb I was “glowing” from this psychological and physical endeavor – glowing is a dancer’s term for sweating so hard you could vomit. As I thought about it later I must have been glowing from another source. In the moments in Tuthmosis III’s tomb I felt the same over whelming shift of physical and energetic consciousness I had felt in all of the historical sites in Egypt. The tens of thousands of people who dedicated their lives to building a singular home of eternity, for their King or pharaoh, left more than a physical space. The vibration of prayers and intention still overpowers the gawking tsunami of us ignorant tourists. As with climbing into the Great Pyramid of King Khufu or visiting the Philae Temple complex near Aswan the spaces infused me with their traits. Somewhere in the house-building phase of my life I read, “You build the space and then the space builds you.” Well, the temples and tombs were building me. I do not separate my physical self from my physical environment and the power of the King’s Chamber of the Great Pyramid, the 65-foot colossi of the peristyle court of Amenhotep III’s tomb and the prayers written in 1425 BCE for Tuthmosis III were reverberating through me. This architecture truly operates as a machine for Liminal Space – a threshold where the observer can enter and be a participant with the original intention of the building. The architecture is sentient – self aware and intelligent as in informs and transforms. It is a powerful experience. Exotic! I repeated to myself. Now guessing this older woman is from the south, and that she had seen thousands and thousands of my black sisters. “Exotic” translates as “racialized other” in my rational mind … exotic? Here in Egypt we are the same, we are both Americans. I pause, and then returned her smile, because in the larger picture she had given me a compliment, and I say, “Actually I am from Minnesota”, as in, I cannot be more un-exotic! She replied, “Well, I am from Texas.” and for whatever reason, we both laughed. However, looking back I knew what she had seen in me. She was watching Africa move along the waterways of my soul. 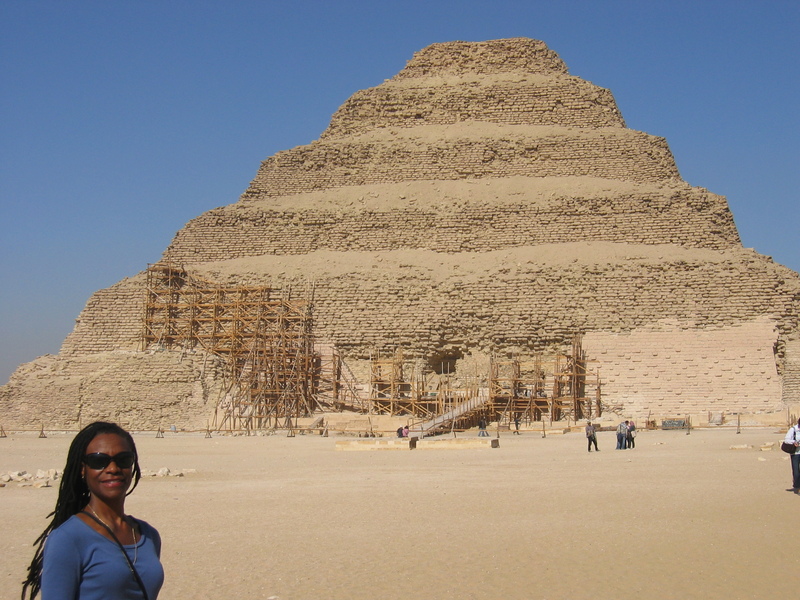 In Egypt I was exotic within and to myself and I was grateful to my Southern sister for pointing it out. It is now 6 am and I have written three stories for my research. The purging of linear words from my mind and the lavender tea has worked because I am finally drowsy. I can now take a Cairo late-afternoon nap.